Transparency Market Research’s (TMR) recent market study on the global subsea pumps market provides valuable insights into the developments of the market between 2014 and 2020. Subsea pumping is commonly used for increased oil recovery from subsea oil and gas reservoirs, especially in low-pressure oil fields. Due to the increased utilization of subsea technologies in offshore hydrocarbon exploration projects, the subsea pumps market will rise at a healthy 7.10% CAGR from 2014 to 2020 to reach a valuation of US$1.5bn by the end of the forecast period. The global subsea pumps market was valued at US$0.9bn in 2013.The report is titled “Subsea Pumps Market - Global Industry Analysis, Size, Share, Growth, Trends and Forecast 2014 - 2020” and is available for sale on the company website. The report points out that the high economic benefits and flawless operational capabilities of advanced subsea pumps are the major factors behind the rising demand for these products across the world. The utilization of subsea pumps is aiding in extending the life of existent gas and brownfield repositories, which, combined with the demand for boosting production of existent projects, is bolstering growth of the global subsea pumps market.However, fluctuating prices of oil and gas will hamper the market’s growth to some extent. To counter this, market players can depend on newly discovered oilfields and a large number of untapped oil and gas reserves that will drive this market in the years to come. The report divides the global subsea pumps market on the basis of product type, application, and region. By product, electrical centrifugal, helicon-axial, submersible pump, and others are the segments of this market. Of these, it is the helicon-axial product segment that dominated the overall market in 2013. The product segment enjoyed dominance due to the extensive use of helicon-axial subsea pumps in boosting oil and gas operations. 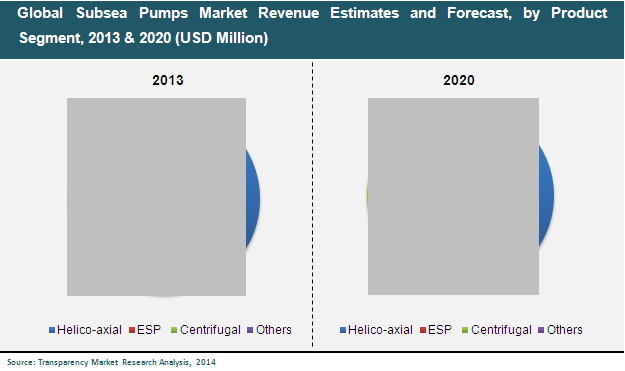 For the forecast period from 2014 to 2020, the demand for helicon-axial pumps will remain the highest, says the report. In 2013, electrical submersible pumps held the second largest share in the overall market. Application-wise, subsea separation, subsea injection, subsea compression, and subsea boosting are the segments of the market. Amongst all, subsea boosting accounted for the largest share of the subsea pumps market in 2013 and will continue to be the dominant segment during the forecast period. In current times, increasing governmental expenditures for offshore exploration and production has been the major factor responsible for the high demand for subsea boosting applications, thereby benefitting the global subsea pumps market. The report divides the global subsea pumps market is divided into the regional segments of North America, Asia Pacific, Latin America, Europe, and the Middle East and Africa. In 2013, Latin America stood as the largest regional segment due to the development of exploration and production projects in deepwater pre-salt reservoirs off the coast of Brazil. The global subsea pumps market is segmented as follows.